This is a complicated chronic condition, marked by inflammation of the joints and occasionally other body organs, which is often marked by periods when it appears to be much improved or worsened. 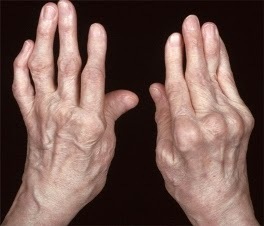 In some cases it can even disappear completely - a condition known as 'burnt out' rheumatoid arthritis (RA). For most people with RA, if treated appropriately, there may be few symptoms and a full, active life is possible. The basic cause of RA remains something of a mystery, but we know it occurs when the body's immune (defence) system reacts to something abnormal in the body and tries to remove it. This response causes inflamed cells to build up in membranes surrounding the joints, and enzymes then released from these cells lead to the breakdown of normal bone and cartilage in that joint, and hence cause the characteristic symptoms of RA. Two features arising from this are usually looked for by doctors. The first is called a rheumatoid factor which is a specific antibody produced in large quantities in RA and no other form of arthritis. This can therefore be detected on special blood tests, and confirms the diagnosis. The second is the presence of rheumatoid nodules - lumps of inflamed cells usually seen on the backs of the hands, feet and elbows. It is typically the small joints - finger joints, knuckles and feet - which are affected first, but any joint in the body may develop symptoms. The pattern varies hugely from person to person but is characteristically seen as symmetrical; if one particular joint is affected on one side of the body then the same joint on the other side is usually affected too. The stiffness tends to be worse early in the morning after waking, and is usually accompanied by tiredness and general malaise. Simple everyday tasks such as dressing or writing may become uncomfortable or difficult. 1. Blood Tests: Your doctor will look for anaemia (common in RA), presence of rheumatoid factor in the blood, evidence of inflammation from tests such as an ESR (erythrocyte sedimentation rate) and CRP (C - reactive protein) test. He will also usually assess other organs such as your kidneys, liver and thyroid gland at the same time. 2. X-rays: Once damage has been done, this becomes apparent on X-raying the joints. Such changes are often seen first in the feet, so your GP may X-ray these even though you do not have any symptoms in them. Other tests which aim to pick up the disease before active damage occurs include ultrasound scanning, bone density tests and magnetic resonance imaging (MRI) scans. • Looking after your joints. Regular exercise - especially swimming - is vital to maintain joint function, and you should use trainers with thick soles to absorb impact when exercising. Your GP will advise you to see an occupational therapist who will show you simple ways to reduce any unnecessary strain on your joints. • Drugs. These are the mainstay of most peoples treatment, and there are four kinds which may be used - simple painkillers, non-steroidal anti-inflammatory drugs (NSAIDs), disease-modifying anti-rheumatic drugs and corticosteroids. • Simple painkillers. These include simple paracetamol and codeine-based painkillers, and side effects are relatively few in this group. • NSAIDs. These work to specifically reduce inflammation around a joint and so reduce symptoms. These include Ibuprofen, Diclofenac and Indomethacin and any side effects are usually indigestion so these are advised to be taken with food. The dose and type will be worked out between you and your doctor. • Disease-modifying drugs. These are not painkillers as such but act to reduce inflammation and slow down the progress of RA. They can take many weeks to begin to work effectively, and are often taken for years. Side effects are more common with these types of drugs, so your doctor will monitor you regularly and take regular blood samples to make sure your body is still suiting them. These can be extremely safe and effective treatments in RA and common examples include sulphasalazine, gold injections, methotrexate, D-penicillamine and azathioprine. * By injection into an affected joint. * By intramuscular or intravenous injection to reduce an aggressive flare of RA, known as a 'pulse' of treatment. * By mouth, often at a dose of below 7mgs daily if possible. If a large collection of fluid forms around a joint, this is known as an effusion and relief may be given by draining this fluid off the joint with a needle and syringe. Other possible treatments include physiotherapy and occupational therapy to promote muscle strength and joint movement and reduce the risk of joint deformity. Every person suffering from RA has a unique pattern of their illness. Most people have a 'remitting and relapsing' pattern where symptoms become worse or lessen for a period - often for weeks or months - before settling again. There may be periods of months or years between flare-ups, during which time there is little inflammation. However, some damage is done to the joints each time they become inflamed. Around 1 in 20 people with RA will have steadily progressive RA but as many as 1 in 5 have very mild RA, causing few problems. An understanding of the condition, allied to prompt treatment of any flare will prevent serious joint damage in the majority of people. It is important to try to maintain as active a life as possible, and take any prescribed medication correctly. Report any new symptoms to your doctor, and you may want to join a local branch of your arthritis support group which many people find extremely helpful. 1. When did your symptoms begin? 2. Are the same joints affected on both sides of your body? 3. Do you have any symptoms not involving your joints such as your eyes or breathing? 4. Have you had any similar symptoms before? 5. Do you have difficulty in doing normal daily activities? 1. Is there a diet which will help my RA? 2. Does the weather make any difference? 3. Should I avoid getting pregnant? 4. Does RA run in families? 5. Am I still allowed to take the contraceptive pill?